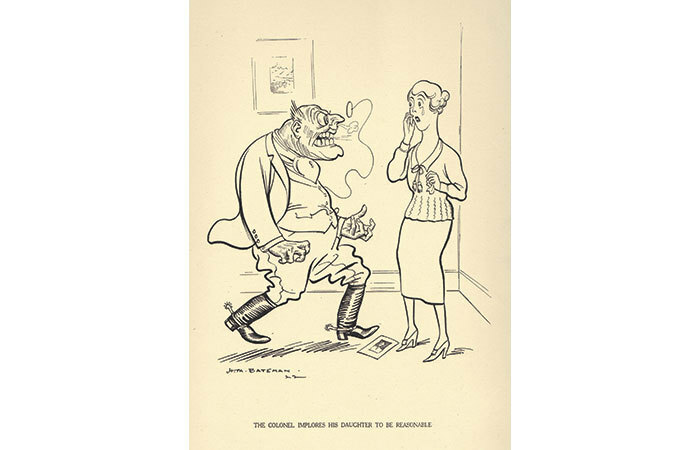 My grandfather H M Bateman was one of the most innovative cartoonists of the early 20th century, and as an artist myself I have, for years, pored over his sketch-books and cartoons. But only recently have I really started to appreciate his other work – the serious paintings. A household name as a cartoonist, he was completely unknown as a painter. 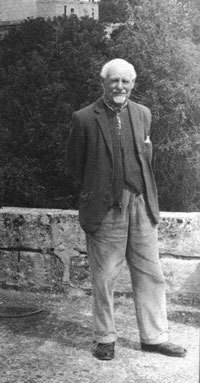 But as well as his cartoonist buddies at the London Sketch Club – Heath Robinson, Fougasse and others – he was also friends with such eminent painters as George Clausen, Lucien Pissarro and Philip Connard and had a lifelong ambition to become a ‘real artist’ like them. At the age of forty, and at the height of his fame, he decided to retire from cartooning and pursue this aim, as he’d hankered to do since his early art school training. He took his painting equipment out into the English countryside, and began to travel abroad in search of inspiring subject matter. A genius in his own field of cartoons he struggled modestly for the rest of his life to master the art of colour and light, continually experimenting with different techniques. 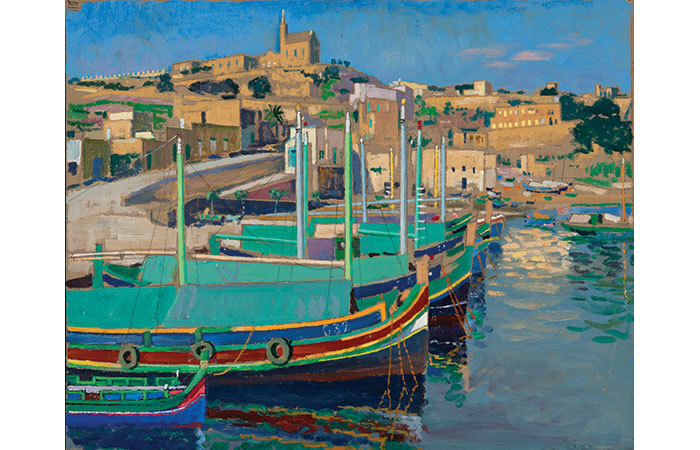 It’s extraordinary that a man who had expressed such extremes of emotion, even violence, in his use of line could produce paintings of such gentle serenity as Fishing Boats, Mgarr. When I decided to go and paint in Malta and Gozo last year I had a strong ulterior motive: Grandpa had spent his last five years there and I had recently come across a number of his paintings of the islands, unspoilt as they were in the late 1960s. The pictures were unsigned, undated and gave no hint of location. Clearly he had little or no expectation of them ever being exhibited. I planned to identify the specific scenes he had painted and to see how they looked now – maybe paint them myself. It involved considerable sleuth work but I was aided and abetted by some very enthusiastic Maltese and Gozitans. The folder of images I took with me was passed from hand to hand until someone, with delight, recognised the view in question. Early on my first morning in Gozo I climbed the steps behind the hotel, built on the site of The Royal Lady Hotel where my grandfather had lived out his days. There I saw a man mending fishing nets, sitting on the ground exactly as Grandpa had painted fishermen forty years before. I asked if he had, by any chance, known an elderly English painter, seen about Mgarr in the late 1960s. He thought not, but then something jogged his memory. At the age of fourteen, he said, he had been walking home one evening when he came across the body of a man with a little white beard, lying in the lane. We have always known that my grandfather had died peacefully, aged 82, while out walking. It was an extraordinary discovery to make within hours of setting foot on the island. The fisherman showed me the view of St Anthony’s Church from his roof, exactly as Grandpa had painted it from the roof of The Royal Lady. I met others who had known him – boat-builders who had chatted to him on his daily painting excursions; his doctor who recalled the impromptu cartoon of the two of them, drawn on his prescription pad. 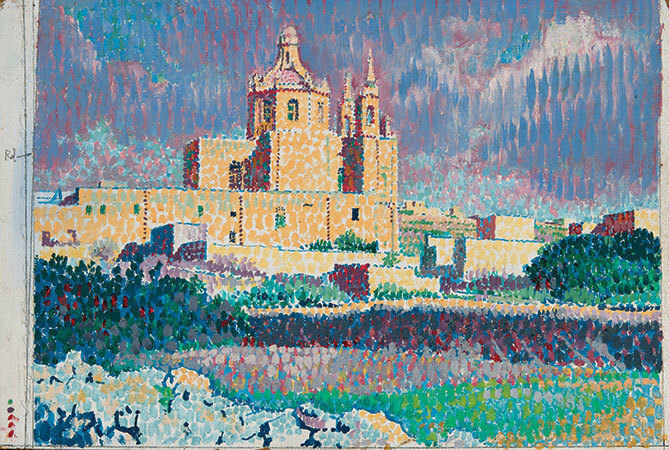 Most rewarding of all was the response to the paintings themselves, which have been hailed in Valetta as a rare and precious record of a bygone era on the islands: the brightly coloured houses, the fleets of extravagantly painted fishing boats and the donkey carts – now nearly all of them gone.